Royal Canadian Mounted Police in Alberta have confirmed that Winnipeg Jets forward Rick Rypien, 27, was found dead in his home in Crowsnest Pass, AB, on Monday. According to a report in the Toronto Globe and Mail, RCMP officials confirmed the death was not of a suspicious nature. 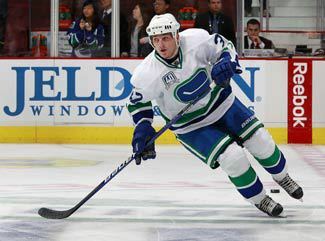 "The National Hockey League sends its deepest condolences to the family, friends and teammates of Rick Rypien, who played the game with so much energy and emotion and whose passing fills us all with a sense of immeasurable sadness and sorrow. The Jets also issued a statement on Rypien's passing: "We are deeply saddened to confirm Rick's passing. As many people are aware, he had strong ties to True North Sports & Entertainment, the Winnipeg Jets Hockey Club, the former Manitoba Moose Hockey Club and the Vancouver Canucks. We would like to express our sincere sympathies to the Rypien family as well as Rick's friends. We also appreciate all of the support that has come pouring in from Rick's fans. Rick was a talented player with an extremely bright future. His hunger for the game made him a valued team member both on and off the ice. This loss has impacted us as more than just a hockey team." The Canucks also released a statement Monday night: "It is with tremendous sadness that the Vancouver Canucks confirm the passing of Rick Rypien. Rick has been a beloved member of the Canucks family for the past six years. Rick was a great teammate and friend to our players, coaches and staff. We send our deepest condolences to the Rypien family at this most difficult time." Rypien had spent his entire six-season NHL career with the Vancouver Canucks, totaling 16 points and 226 penalty minutes in 119 games. He had 1 assist and 31 penalty minutes in nine games this past season. He missed part of the season on a leave of absence due to personal reasons. He also had 2 assists in 11 American Hockey League games with the Manitoba Moose, and 1 goal in seven AHL playoff games. Rypien's previous success with the Winnipeg-based Moose -- he spent parts of five seasons there and became a fan favorite -- had led to his signing with a one-year, $700,000 contract with the Jets last month.